So there’s this one former Brewer who is coming to town this weekend with the team he manages. Ring any bells? His number is retired by the team and adorns the Miller Park roof track façade. He’s a member of baseball’s Hall of Fame. Need another hint? Okay, how about a visual instead. Look familiar? How about a personally signed photo of in-game action that looks sneakingly similar to that which they must have based the Brewers based the upcoming Molitor bobblehead? Molitor’s hustle is well-documented and now you have a chance to own this autographed photo, signed in person by Paul Molitor himself during his public appearance at Legends of the Field’s store in Delafield back in January of this year. …You also must be following @BrewerNation and the supplier of this excellent giveaway item, Legends of the Field (@lotfautographs) on Twitter in order to qualify. The Milwaukee Brewers will celebrate Fan Appreciation Night presented by Chevrolet at Miller Park on Saturday, September 27 against the Chicago Cubs. The evening will include numerous giveaways and prizes, and one lucky fan will win “The Ultimate Tailgate” grand prize: a 2014 Chevy Equinox and a $1,000 gift card to Pick ‘n Save. The Chevy Equinox features a custom Brewers wrap (see attachment) and will be displayed at Miller Park and various Pick ‘n Save stores in the Greater Milwaukee area beginning this week. Along with the Chevy Equinox, the Klement’s Famous Racing SausagesTM will make special appearances at the store locations. In addition, five pairs of tickets for Fan Appreciation Night and Pick ‘n Save gift cards will be given away during each appearance. All fans in attendance on Fan Appreciation Night presented by Chevrolet will receive a 2014 Brewers team photo and a 2015 Brewers magnetic schedule. Additionally, all fans will be entered into a drawing for the chance to win fabulous prizes, including autographed memorabilia, gift certificates to the Brewers Team Store by Majestic at Miller Park and many additional prizes from team corporate sponsors (prizes subject to change). Tickets for Fan Appreciation Night presented by Chevrolet are available at the Miller Park Box Office, online at Brewers.com or by calling the Brewers ticket office at (414) 902-4000. We gave away four autographed photos in our last contest featuring Jean Segura, Yovani Gallardo, and Scooter Gennett. 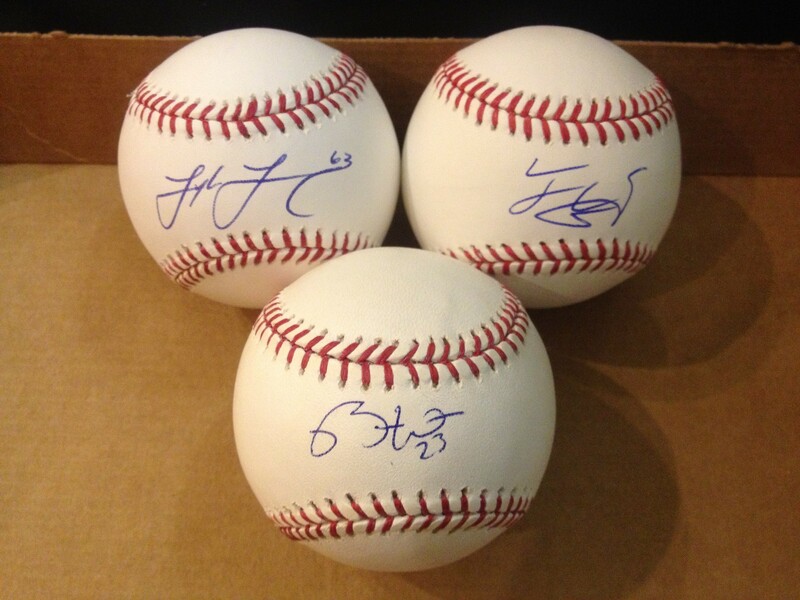 Next week Monday, my sponsor and I will be giving away the three autographed baseballs pictured below. Note: There will be one ball guaranteed to go to a Twitter entrant and one ball guaranteed to go to a Facebook entrant. If you want a chance at all three baseballs, you must enter the contest on both platforms. That’s it! We’ll select the winners at random on Monday, March 31st…just in time for OPENING DAY!!! 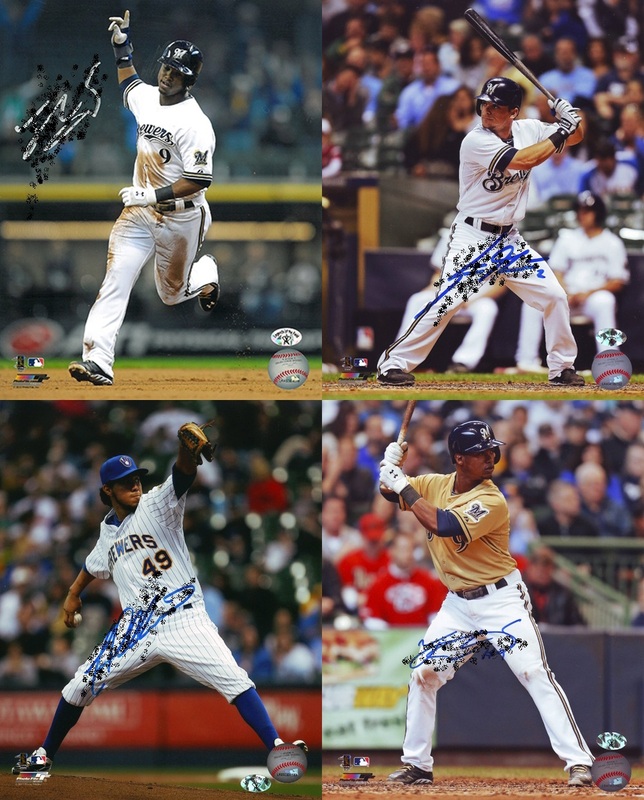 What better way to commemorate the start of a new season than with a new addition to your autograph collection from your trusted source of Brewers memorabilia, Legends of the Field? Good luck and GO BREWERS!! Also, the first fruits of my partnership with @lotfautographs will be announced on Friday evening. Stay tuned for that, Brewer Nation! And here are the details and instructions on how to participate (and possibly win!). If you already follow both of us, you’re already entered! Otherwise, accomplish both of those goals by 11:59pm CST on Friday, March 7, 2014 and you’re entered to win. It really is that simple. You’ll be entered to win one of four signed 8×10 photos. However, what you can also do though is tweet both me and Legends of the Field if you’d like to be considered specifically for one photo over another. So what are the photos, you ask? Allow me to offer Exhibits A, B, C, D. (I digitally added “smudges” to the computer image so as to discourage downloads/printing. Believe me that the actual photos are beautiful and the signatures are crisp!) If you choose to enter yourself in the drawing for a specific photo, just tweet both of us the letter of the photo you’d like to be entered to win. I realize that anyone can see this post, including in my Facebook and Google+ communities as well as the general internet. This is a “Twitter Only” contest to kick things off. There will be other community-specific contests down the road, but if you want in this time and you don’t have a Twitter account……well, make one and follow us! Also, keep your eyes open mid-next week for a special opportunity related to this contest.